Last weekend's astounding box office will be met by... a giant-sized meh, as we get a sequel for a film that might be one of the least memorable blockbusters in the last decade, and that's basically it. 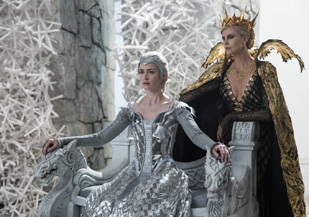 The Huntsman: Winter's War is the sequel to 2012's Snow White and the Huntsman, the FX demo reel that happened to also star Kristen Stewart, Charlize Theron and Chris Hemsworth, at the height of his Thor fame. Debuting the start of the “let's make fairytales, and everything else, gritty and dark" phase, it opened to a surprising $56 million and made over $400 million worldwide. It's now famous mostly for being the movie where director Rupert Sanders cheated on his wife with Stewart and that weird milk bath scene. This, along with tons of demand from overseas markets, is apparently enough to greenlight a second film, with Winter's War taking the prequel route. This brings back Hemsworth and Theron, and adds on Jessica Chastain and Emily Blunt, with the latter playing the good queen to Theron's evil incarnate, and and some battle for some fantasy land that we've never really heard of or care about takes place. The whole thing feels like warmed-over Hobbit, and that series did its level-best to smack the fantasy genre around a bit and take some air out of it. This looks to be a rather soulless but pretty demonstration of the power of foreign markets, and a slightly more marketable version of a film that might have been made by Alex Proyas or Tarsem Singh. Released two weeks ago in most major foreign markets, it has earned about $40 million to date, which isn't that impressive, but it has some time to work. In North America, I expect this to be greeted with a spectacular yawn, or perhaps even an angry one. Why must this exist? I guess at least it's a female-heavy cast in an action film, so that's something. I'd look for about $22 million.